Since ending the Cleo Hill era in 2015, WSSU hasn’t beaten Shaw. The team and its coach are looking for redempton. 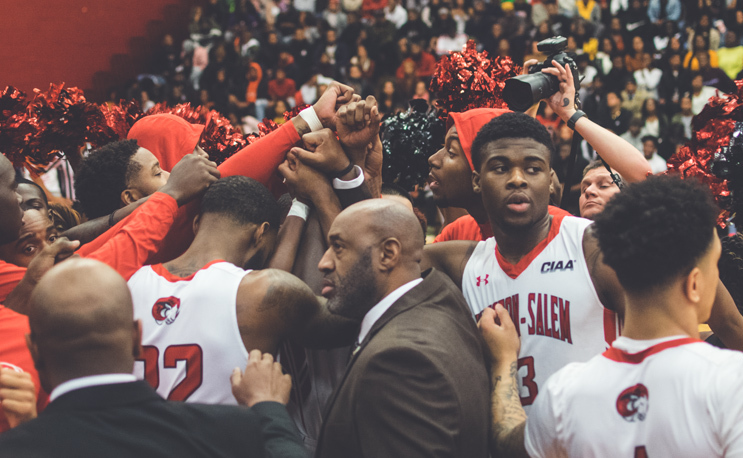 Winston-Salem State beat Shaw in the quarterfinals of the CIAA Tournament in 2015. That game turned out to be Cleo Hill’s last game on the bench for SU as his contract was not renewed the following season. After three seasons away from the game, the former North Carolina Central guard is back in the CIAA as coach of the school his father brought to prominence in the 50s and 60s. Shaw replaced Hill with Joel Hopkins Sr., who led the program to its first CIAA title in 2002. Hill was an assistant on that team and later assumed the reigns of the program, leading it to another conference title in 2011. Shaw has won all six matchups in the past three seasons since Hill’s contract was not renewed in 2015. But this game will be compelling for more than just history. It features two of the top three scorers in the CIAA. WSSU’s Rob Colon averages 18.3 ppg for the 8-7 squad. Amir Hinton of Shaw leads not only the CIAA but the NCAA in scoring at 31.9 points per game. And as always, every loss in the division can come back to bite you come mid-to-late February. The game will tip-off from the C.E. Gaines Center in Winston-Salem at 7:30 P.M. The game will be shown live on the CIAA Sports Network. Livingstone’s Roger Ray has been on fire as of late. He’s scored better than 26 points in four of his team’s last five games, including a career-high 33 points against Claflin on Saturday. He’s been locked in from the 3-point line, hitting 18-of-33 attempts from long distance. LC will host Fayetteville State on Wednesday. Three years ago, Terrell Leach landed on the CIAA scene as a bucket-grabbing freshman guard for Winston-Salem State, helping WSSU to the CIAA Championship Game that season. He then fell off the radar after academic troubles sidelined him. Like Cleo Hill, Jr. he’s back in the league with a new squad, playing with defending champion Virginia Union. Through six games he’s averaging a team-high 17.8 ppg, including a 31-point performance in against Shaw. His scoring punch will be vital if VUU expects to defend its title. VUU travels to Bowie State on Wednesday night.